Guide to San Francisco's "Painted Ladies"
One of San Francisco's most iconic images of those candy-colored San Francisco Victorian style homes they call the Painted Ladies or "Postcard Row" viewed from Alamo Square Park. You know it on sight: the little row of pastel houses with the modern city skyline behind them. Those houses and others might make you turn your head and think, "hey, I've seen that somewhere." You could be looking at the home from the opening credits of Full House or the house where Mrs. Doubtfire was filmed. See the Painted Ladies now: To see that view, some other fun locations that you'll recognize from television and film, along with some gorgeous examples of San Francisco's best Victorian architecture — when you click through this San Francisco Victorian Houses photo tour. Technically Victorian refers to an era and not a style; it's often used as a catch-all term for the exuberant, sometimes quirky and charming structures built between 1840 and 1900. After the 1849 Gold Rush, San Francisco was in a heyday of construction and abundant local redwood enabled lots of architectural ornamentation. Despite the devastating 1906 fire, many of these structures are still standing today. Find what remains of the past by taking one of the tours or walks below. Haas-Lilienthal House: An exuberant, Queen Anne-style Victorian built in 1886, it's the only private San Francisco home of the period open to the public on a regular basis. Add one of the docent-led tours held three days a week to your itinerary. Octagon House: An eight-sided, two-story house built in 1861, it's not a typical Victorian-style house but something much rarer. In fact, it was one of only five such homes built in early San Francisco. It's open for tours on an infrequent schedule, which is posted on their website. San Francisco City Guides offers three tours focusing on Victorian architecture: You can take their Pacific Heights Mansions for a walk past magnificent homes and consulates in Pacific Heights and learn about Victorian lifestyles and earthquake refugees and what life must have been like right after the 1906 earthquake. 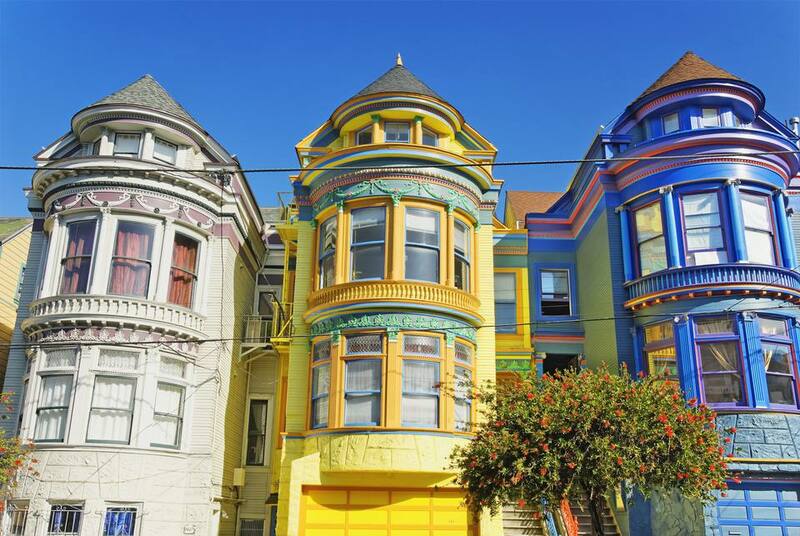 Their Victorian San Francisco tour focuses on early twentieth-century mansions, and the Victorians of Alamo Square Walking Tour takes you to see those “Painted Ladies” and the world famous Postcard Row. San Francisco Architectural Heritage also gives walking tours of Pacific Heights Victorians and their walk along Broadway, includes the Mrs. Doubtfire house. Victorian Home Walk picks you up in Union Square and takes you by bus to Pacific Heights for a relatively flat stroll through some of the best Victorian neighborhoods and a visit inside a Queen Anne-style Victorian house. Get a taste for the lives of the richest residents both then and now. If you want to go on your own, Alamo Square's Postcard Row is on Steiner Street between Hayes and Grove, a few blocks south of Geary. The surrounding area is filled with excellent examples of the Victorian style. You'll also find many more of them in the Pacific Heights neighborhood around Broadway and Steiner — and in the Haight-Ashbury neighborhood near Golden Gate Park. Several of the nicest San Francisco bed and breakfasts are in Victorian structures. Chateau Tivoli is a particularly beautiful example, near Alamo Square and a good base for neighborhood walks. Aficionados talk of Gothic Revival, Queen Anne, Stick, and many other variations, debating what category any individual structure falls into. If you're a student of architecture, you can get a good overview on several websites. For the rest of us, it's better just to enjoy what you see - and if you call them all "painted ladies," you can't go wrong.